Today, 20 June, is World Refugee Day 2015. It coincides with the day of a huge anti-austerity demonstration in London that is rather narrowly concerned with the politics on the British isles – a politics that on the whole seems to become frightfully more insular by the day. And that links it back to world refugee day – even if solidarity with those persecuted in far away lands is regrettably not on the placards: As labour leadership contender Jeremy Corbyn, a speaker at the closing rally, says more generally: Austerity serves as a “cover” for deepening inequality which, I would add, makes it devoid of solidarity with those less fortunate, of any class, race or nationality. A recent headline in The Guardian summed up the combined insular and un-solidaristic contemporary mainstream politics in paradigmatic fashion. It read: ‘Since 2011, four million Syrians have fled their war-torn homeland. The UK has offered shelter to just 187’. A headline that needs little further elaboration. Of course there are exceptions, but they remain on the margins, not least in relation to British geography. The first Prime Minister’s questions after the general election on 3 June 2015 is a potent example here: The only MP who did focus on the then very pertinent issue of Mediterranean refugee deaths and the wider dynamics behind refugee movements, calling them a ‘stain on the conscience of Europe’ (note: not only Britain but indirectly accepting the existence of something like European values) was a Scottish MP, Angus Robertson, MP for Moray Constituency. He also voiced the opinion that clearly more needed to be done than sending the British military into the Mediterranean, including, in his words, ‘offering refuge and asylum to those who need it’. Not surprisingly, the PM, who earlier in the debate had defended a potential withdrawal from the European Convention of Human Rights with the criminal activities all those ‘foreigners’ would continue to commit ‘over and over again’ in the UK, refuted the latter claim and advocated for creating a regime in Libya refugees could be sent back to, combined with measures to stop this ‘criminal trade’. I have written elsewhere that not the people smugglers are the problem – they ultimately offer a service as no legal route into the EU exists to apply for asylum – thus this needs not be repeated here. And there are other, localised exceptions on the ground that counter hegemonic policy and practice hospitality and compassion. Those include for example the City of Sanctuary movement, as well as often small scale initiatives that help transform the lives of individuals involved in them. An example from my own work and networks are Pod Collective, formed by two creative and energetic women in 2012 who use their own artistic skills to bring refugee lives and stories out in the open and at the same time transform the lives of those refugees who participate in their projects. 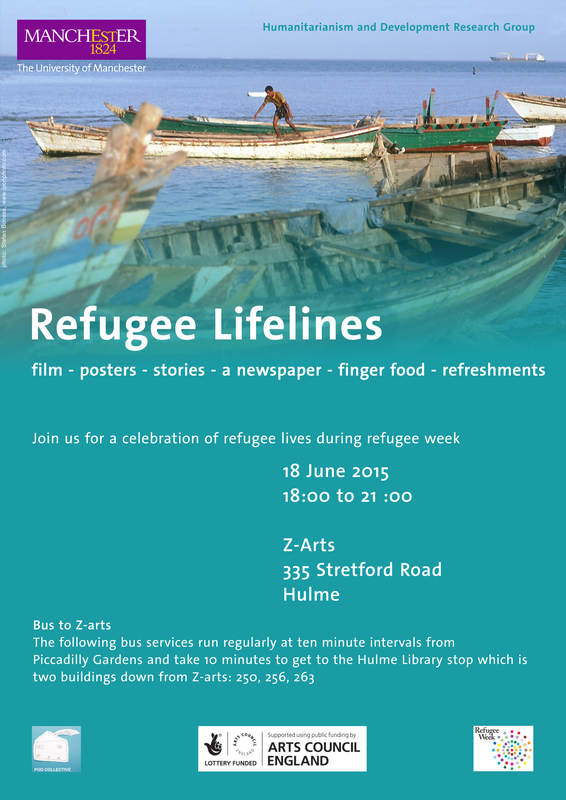 Based on my own research with refugees in Thessaloniki, Greece, that resulted in a documentary film focusing on individual life trajectories of refugees shot by a refugee filmmaker, we held a joint event at Z-Arts, a creative learning space for disadvantaged children and youth in Hulme, in walking distance of Manchester University, during refugee week on 17 June 2015. The event showed on a small scale that academia and activism can come together not only in joyful celebration but can also create small islands of resistance and/or counter-narratives – even if those may have little effect on the wider politics of a country driven by an ideology of austerity that extends solidarity neither to its own people nor those from far-away places in need. And in the not so near future, the link created by MP Robertson to the values of Europe, however vague, might be broken altogether. The EU referendum campaign as propagated by the new government at least is very much based on holding a gun to Europe’s head: either you do as we tell you, or we leave. As a EU citizen in this country, my personal inclination initially is to wish for Britain to stay – not least because I might become a ‘real’ foreigner with even fewer rights as a result. But as a European citizen, I would hope Europe holds firm and does not move down the line of a British agenda where solidarity and compassion are yet more absent than in the official European response to for example the refugee crisis. In any case, what I wish for or not is irrelevant for the final decision, thus I am spared agonizing over how I should vote: While I pay my taxes in this country and even own property, and overall in the cost-benefit calculations that dominate Tory ideology contribute much more than I will ever ‘gain’, I will not be allowed to vote on how my future here might look like, as I am neither from the Republic of Ireland, Malta nor Cyprus (the only EU countries who will be allowed to participate in the referendum). ‘No taxation without representation’ does not apply to people like me in the UK. When should I seriously plan my exit strategy (at least I belong to those privileged enough to have a choice when and how to leave)? I fear sooner rather than later – but maybe enough people can convince me otherwise through acts of activism and solidarity worth of the name. Until then, any job offers from beyond these increasingly hostile isles are highly welcome! This entry was posted in Uncategorized and tagged austerity, EU, referendum, refugee, solidarity. Bookmark the permalink.